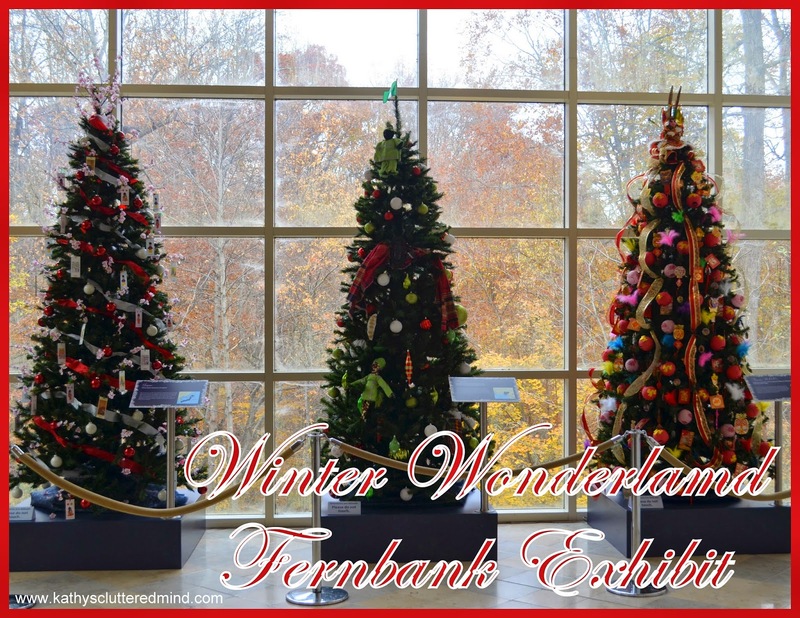 Experience a trip around the World when you visit the 5th annual Fernbank holiday exhibition, Winter Wonderland: Celebrations & Traditions Around The World. The exhibit opens November 21, 2014 and will be on display through January 11, 2015. Families can stroll along the entry and upper level hallways which are literally decked with 30+ Christmas trees, each beautifully decorated by cultural partners from the Atlanta community. 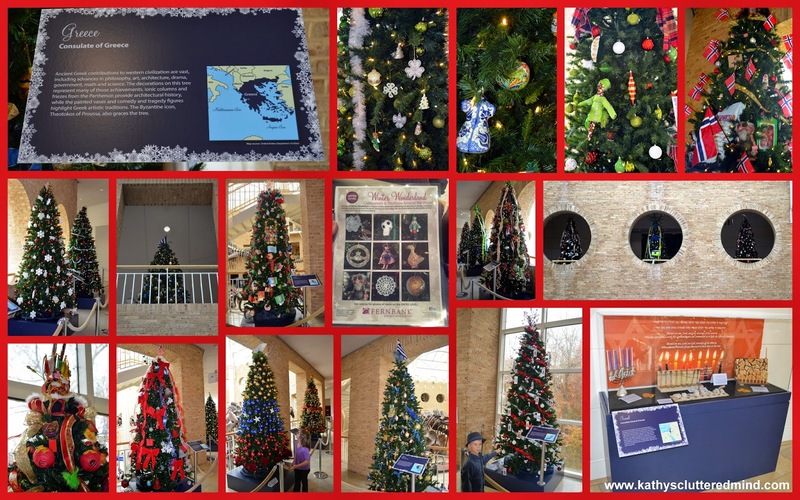 The trees showcase traditions and holidays that are celebrated by other cultures during the holiday season and throughout the year. Countries from all 7 continents are on display including France, Greece, Puerto Rico, Sweden, China, Denmark and more. Trees are adorned with twinkling lights, colorful ornaments and other amazing treasures. In front of each tree is plaque displaying information about the country, their traditions and a map. My children had a fabulous time last year (check out the photos below). They got to experience Christmas, Hanukkah and the Festival of Lights all in one day. It was a fantastic way for the children to embrace and learn about other cultures, traditions and holiday celebrations. Each tree introduced us to types of artwork, national symbols and more from around the World. Both children loved the self-guided laminated scavenger hunt activity sheet they received from the greeter when we entered the museum (be sure to return the guides when you leave). While we traveled from tree to tree the children got to match the ornament photos on their sheet to the displays. It was a simple, great activity for families! Last year we attended during the opening weekend so there were a few special activities going on. When we arrived we received a schedule of events. 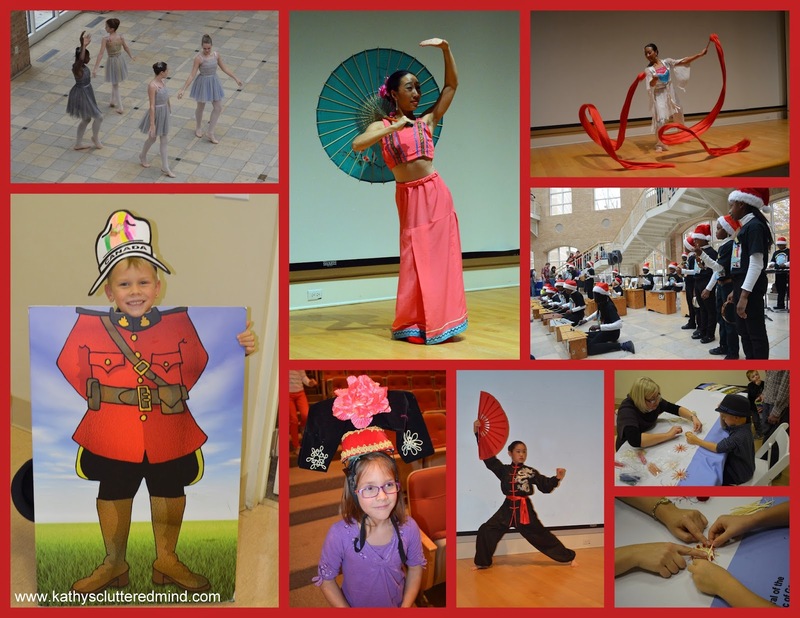 There was a Chinese Dance performance, Atlanta Ballet Nutcracker ensemble, Duniare Elementary Dynamic Dolphins xylophone ensemble and Atlanta Junior Ceili Band performance. All of the performances were amazing and very engaging. There were also a couple fun craft projects which included a Straw Star craft sponsored by the German Consulate General of Atlanta and a Royal Canadian Mounted Police Hat craft sponsored by the Consulate General of Canada. The consulates were amazing and really encouraged the children. The German consulate representative even shared with the kids how she used to make the same type of star ornament in Germany when she was Kindergarten. There was also a roaming Santa-saurus. Santa-saurus is Fernbank's mascot, Giggy A. Dinosaur. Santa-saurus will be making special appearances on the weekends while the exhibit is open so hopefully you catch a glimpse of him, he is really cute! This years Winter Wonderland Celebration Day takes place on Saturday, November 22 from 10 a.m. – 2 p.m. This year families will enjoy a special day of cultural and holiday-themed performances from The Atlanta Ballet’s Nutcracker Ensemble, the Chien Hong School of Kung Fu and Peruvian group Apu Inka. Fernbank has many other fabulous must see exhibits as well like Goose Bumps The Science of Fear, A Walk Through Time In Georgia, Conveyed In Clay and more. And of course there is the Fernbank Nature Quest play and education area! But this isn't the only special thing happening at Fernbank through the holidays. Be sure to also check out the Holly Jolly Film Activities, Martinis and IMAX and the special holiday shopping days for members. Visit the event calendar for further details...some are also highlighted below. The fun continues on weekends from November 29 through December 21 with Holly Jolly Activities, featuring a Puppet Factory hosted by The Center for Puppetry Arts on Saturdays from noon until 2 p.m., winter-themed Tadpole Tales on December 27 and 28 at 1:30 p.m. and classic holiday cartoons every weekend. Disney's Sing Along Songs: Very Merry Christmas every weekend from November 29 – December 14 and daily from December 19–24. Fernbank’s Museum Store offers a variety of gift ideas, including dinosaur merchandise, jewelry, activity books, science kits, games, toys, ornaments, and more. The Museum Store’s annual holiday sale offers an additional 10% off store purchases for members only on December 6 and 7, 2014. Adults can enjoy music, films, small plates, a nip from a yuletide toddy and more as they enjoy evening viewing hours of Winter Wonderland during Martinis & IMAX on November 21, December 5, December 12 and December 19 from 7:00 p.m.-11 p.m. Admission to Winter Wonderland: Celebrations & Traditions Around The World is included with museum admission and free for members. Museum tickets are $18.00 for adults, $17.00 for students and seniors and $16.00 for children ages 3 to 12 (ages 2 and under are free). Martinis & IMAX prices are $8 for cover charge or $13 for an IMAX® film ticket, which includes a free cover charge. Hours of the Museum are Monday through Friday, 10am to 5pm; Saturday, 10am to 5pm and Sunday, 12 pm to 5pm.